Soffritti was born in 1877, in Ferrara, Italy, and died in 1927. 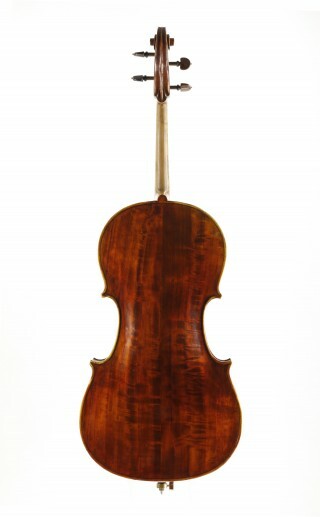 He learned violin making from his father, Luigi Soffritti. He left behind many pupils and followers in Ferrara, including Anselmo Gotti, Ernesto Pevere, and Gaetano Pareschi. 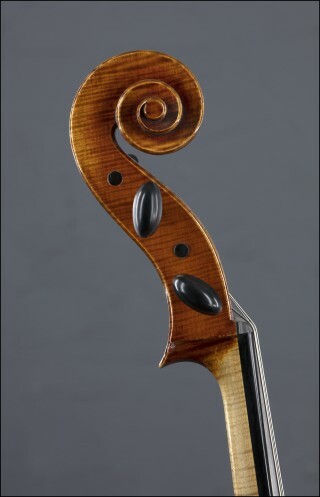 The cello has a striking and beautiful Lombardy poplar back with matching sides. The top is spruce, and the original neck and scroll are native Italian maple. It has a beautiful dark reddish brown color. The cello's current owner purchased it in 1977 in Washington, DC., and played it professionally for many years until she brought it to me recently to sell for her. She played in various orchestras in the U.S., Warsaw, Poland, Netherlands, and Germany, and taught countless students how to play the cello. She says she "wants a cellist to let this instrument sing. He (the cello) already knows the orchestra repertory. I want this instrument to bring joy and passion to the next player the way he has for me". This is a great cello! Come and try this cello! You will like it! Please call for an appointment. 651 698-4692. 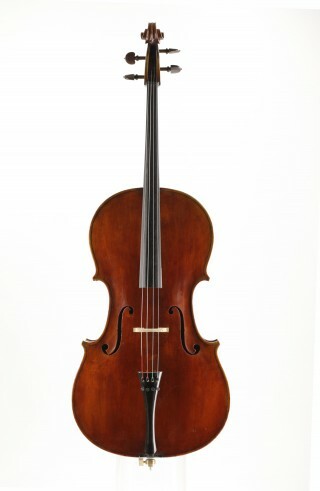 Robert Jamieson (Bob) acquired his Montagnana cello in 1988, and Bill and John made a copy of it together. Bob bought the copy from us, and played it for many years during the remaining time he was in the Minnesota Orchestra, and after he retired. He enjoyed playing on it and often talked aout it being easier to play than the Montagnana. Bob took very good care of the cello until he passed away. The cello is available now. I chose the very best wood for this cello. I am excited to offer it to you! Please call for an appointment soon! Scott Zumberge, Minneapolis, 1982. The sound of this cello is warm and full. 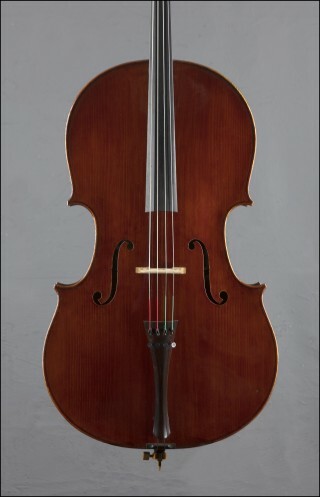 This cello is pictured in the book "Violin and Bow Makers of Minnesota", a publication of the Schubert Club Museum. 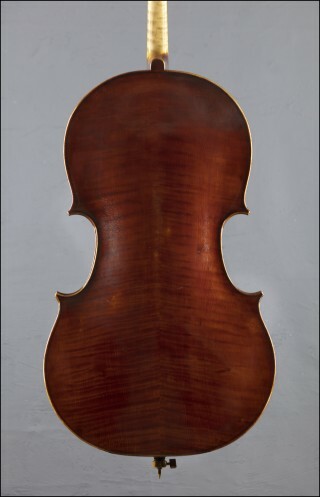 Paul Hart Cello #355. 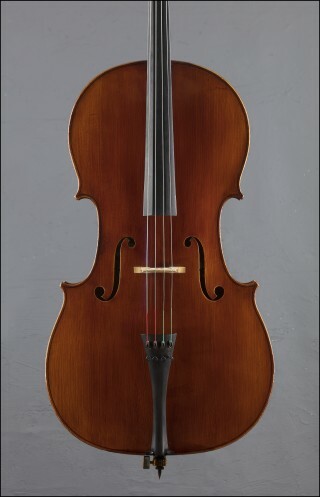 Made in Salt Lake City in 1996, Stradivari model, Great condition. Paul made this cello on the famous Stradivari Forma B model. The wood is excellent. Paul Hart is a much admired contemporary maker. He has won many awards and taught violin making to many younger makers (including me!) This is a great cello! Sold! Mint condition. Philip is a current maker living in Northfield, the uncle of Ryan Soltis. Philip helped David Folland for many years in his shop. This cello will give many years of satisfaction! Savannah Strings, many models, including Stradivari and Montagnana. 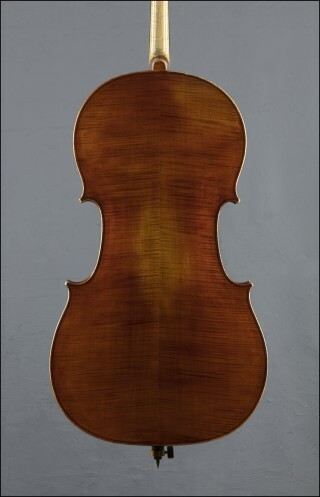 "Camillo Callegari" China, 2010, Stradivari model. Musaica, China, 2010. Very good conditon. Bernd Dimbath, Bubenteuth, Germany, 2003, Great condition. Stohr, Illner, and Riedl, Germany, 1995, Dark Reddish brown color. Wenzel Fuchs, Erlangen, Germany, 1969. Savannah Strings, several models, including Stradivari and Montagnana. Clemente and Weise, Bubenreuth, Germany, 2004. Excellent condition. Ivan Dunov, Reghin, Romania, 2008, Storioni model. Paul Hart, Salt Lake City, Utah, 1986 A great cello for someone looking for a slightly smaller cello with a big sound! Call for price. Andreas Eastman, China, 2011 VC 405.